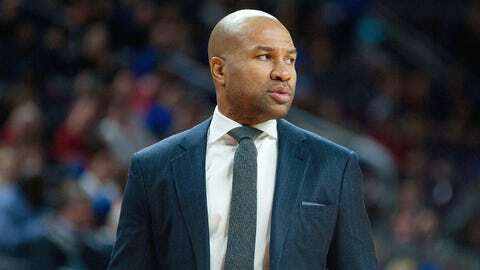 Derek Fisher is trying to recover from a tumultuous first season as Knicks coach. Conventional wisdom says that a team is rebuilding when it’s coming off a 17-win season, the worst campaign in the franchise’s history. But don’t tell Knicks coach Derek Fisher, who thinks his team is getting ready to win this upcoming season — or at least that’s the message he’s telling the media. The New York coach says his team will be more competitive than prognosticators think. The Knicks didn’t come away with any marquee free agents, but did land solid players in Robin Lopez. Arron Afflalo, Derrick Williams and Kyle O’Quinn, among others. The Knicks are hardly the Hawks, who jumped from 38 victories to 60 last season. First off, even during the subpar season that Fisher alludes to, Atlanta won 38 games, more than twice as many as the Knicks did last season. Plus, the Hawks were hit with a load of injuries during that season, including one to their best player, Al Horford. Of course, you could say the same thing about the Knicks last year with Carmelo Anthony and his knee issues. The Knicks will certainly be better, but comparing your team to the reigning Eastern Conference No. 1 seed appears a little overzealous.